BAYANTSOGT, MONGOLIA-MARCH 8 : Munkhbat (r) struggles to deal with loosing almost half of his herd sitting with his wife Munkhamgalan and babyAnuungoo, 4 months inside their small nomadic hut March 8, 2010 in Bayantsogt, in Tuv province in Mongolia. 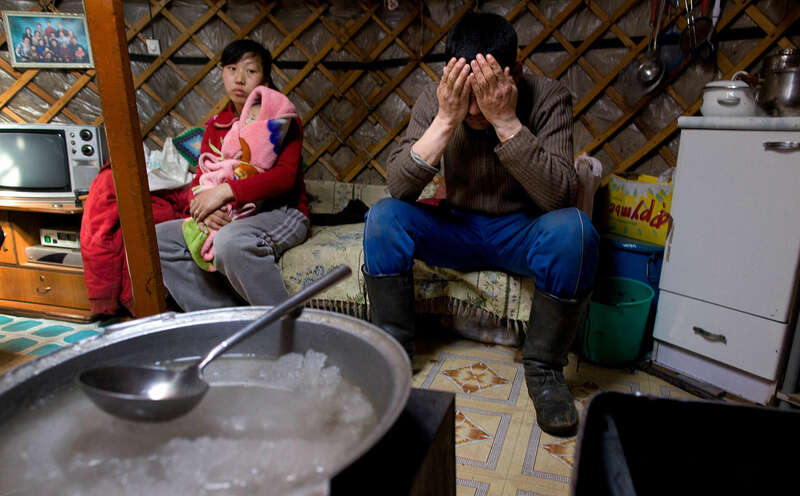 Mongolia is still experiencing one of the worst Winters in 30 years with 68 % of the provinces effected. Presently the government has declared an emergency requiring foreign aid to alleviate the impact of the " Zud" ( Mongolian term for a multiple natural disaster) caused by bitter cold and thick snow. Recently, the UN allocated $3.7 million for humanitarian assistance to Mongolia from its Central Emergency Response Fund (CERF). The United Nations Development Program (UNDP) is developing a cash-for-work program under which herders will earn income to clear and bury the carcasses of the over 2 million livestock that have perished nationwide. Currently 1.5 m goats, 921,000 sheep, 169,000 cows and yaks, 89,000 horses and 1,500 camels had died according to the various UN agency reports.